In 2017 alone, the Malaysian government is targeting 31.8 million tourist arrivals. The tourism industry is widely credited for helping to stimulate our economy, and the hotel industry has grown to follow suit and meet the rising demand. 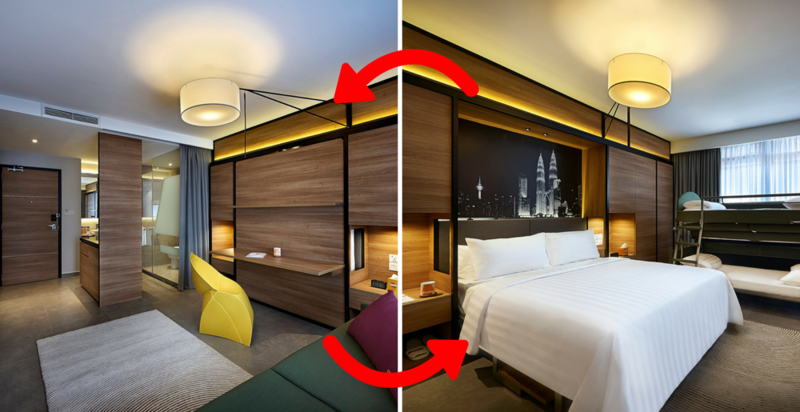 Berjaya Hotels & Resorts (BHR) are making another entry into the market, this time with their new hotel concept which they named “thelivingroom”. thelivingroom hotels will all have only one room type which can accommodate up to a maximum of 4 people at a time. So it doesn’t matter if the user is travelling solo or in a group of 4—the type of room they get will be the same. Designed specifically to meet the needs of corporate travellers with families, thelivingroom hotel emphasises on space efficiency. From the moment you enter, the ground floor does double duty as a check-in counter and F&B outlet, with a reception and café. The wall bed doubles as a simple shelving unit which can also serve as a work table. When not in use, it can be folded up to maximise floor space, “transforming the bedroom into a living room”. Once the cushions are lifted, the bottom of the sofa moves to the top and transforms into a bunk bed that can fit two adults. The ceiling lights can be repositioned to wherever they’re needed. Meant to be the statement piece of the room, it can be easily folded and stored away when not in used. There are currently two thelivingroom hotels mapped out for completion in 2018 in Malaysia. BHR also plans to expand the chain of thelivingroom hotels globally, to Thailand, Singapore, Indonesia, Vietnam, Hong Kong and Japan. “That means we are expecting a payback period of 5 to 6 years for our investors. The typical payback period takes about 12 to 15 years,” said Hanley.